When it comes to archaeology, there is a major difference between the support for the Bible and the Book of Mormon. Plenty of evidence shows that the Bible describes real people and real places, so most biblical events require very little faith. However, there is little to no support for anything described in the Book of Mormon. In 2008 I toured Israel for the first time and fell in love with the archaeology of the Bible. Since that time, I have been training to become the religious guide for the Tri-Grace Ministries Israel Tours under my teacher and mentor Joel Kramer. What I have learned in support of the trustworthiness of the Bible has revolutionized my witness with LDS people. Before we review how real people, real places, real events, and real manuscripts of the Bible can be used as a witnessing tool, we need to first understand what Mormons are taught about two of their volumes of scripture. The Book of Mormon is the most important of the LDS Standard Works. It is said to be the “keystone” of the Mormon faith and “the most correct of any book on earth.” Mormons place trust in the Book of Mormon as containing true history of the early Americas from about 600 BC to AD 400. Like the Bible, the Book of Mormon claims to have been written by prophets of God; its fifteen books are believed by Mormons to be inspired scripture. The King James Version of the Bible is also one of the LDS scriptures, but it is considered to be the least authoritative. First Nephi chapters 13 and 14 in the Book of Mormon describe a “great and abominable church” that would arise after the death of the Lord’s apostles. This church is said to be the “whore of all the earth” because she would change the Bible by removing “many parts which are plain and most precious” and “many covenants” of the Lord Jesus. Isaiah 5:20 perfectly describes what Mormonism has done with the Bible and the Book of Mormon: “Woe to those who call evil good and good evil, who put darkness for light and light for darkness, who put bitter for sweet and sweet for bitter!” LDS people have been deceived into doubting the book they should not doubt (the Bible) while being told to trust the book they should not accept as historical (the Book of Mormon). An understanding of biblical archaeology can correct this upside-down thinking. When it comes to the Bible, archaeology provides evidence for why it can be trusted. The Book of Mormon, on the other hand, is faced with an alarming lack of archaeological evidences. To illustrate the dilemma Mormonism faces regarding Book of Mormon evidences, go to www.TriGrace.org, click on “Resources” and watch the video tutorial titled “Book of Mormon Archaeology.” This video explains what happened when a biblical archaeologist, Dr. Bryant Wood, went to Brigham Young University to talk with a Mormon archaeologist, Dr. Kerry Muhlestein. Their candid conversation reveals the fact that no archaeology in the New World has been found that supports any person, place, or event mentioned in the Book of Mormon. Let’s take a look at how archaeology can support the trustworthiness of the Bible. In the March/April 2014 issue of Biblical Archaeology Review, Purdue University scholar Lawrence Mykytiuk wrote an article titled “Archaeology Confirms 50 Real People in the Bible.” (This title was later changed to “53 People in the Bible Confirmed Archaeologically”—click here for the article.) Following are the names of Israelite leaders from this article that are identified through archaeology. This list of 22 Israelite officials is impressive. Not shown here are the names of others mentioned in the article from the other nations surrounding Israel, including Egypt, Moab, Aram-Damascus, Samaria, Assyria, Babylon, and Persia. It should be noted that the list comes only from the Hebrew (Old Testament) Bible and does not include New Testament persons who have been identified through archaeology. There is not even one Book of Mormon person whose identity has been verified anywhere in the Americas. Hundreds of biblical sites have been identified through archaeology. One question that often comes up when identifying a site is, “How can we know for certain these sites are the places the Bible talks about?” Let’s take a look at just some of the places we visit on the tours I lead to the Holy Land. The ancient site of Gezer is mentioned throughout the Old Testament. During the archaeological excavations at Gezer, thirteen ancient boundary stones were found that say “This is the boundary of Gezer.” You can see the stones here. Click here to see Joel Kramer describing these stones at Gezer. Another interesting site is ancient Gibeon. How do we know the site we call Gibeon is biblical Gibeon? Numerous ancient storage jar handles in different excavations have been found with “Gibeon” inscribed on them. Click here to see the inscribed handles. The most mentioned city in the Bible is Jerusalem. We know the “Old City Jerusalem” located within modern-day Jerusalem is really biblical Jerusalem because Jerusalem has been continuously inhabited since ancient times. No one questions the identification of Jerusalem because for countless generations people have lived in this city. The second most important and powerful city in ancient Israel was Lachish. During the Assyrian conquest of Judah in 701 BC, the Assyrian king Sennacherib conquered Lachish and then created a massive relief of the entire battle. The evidences for this famous battle, as seen in the Lachish reliefs, are abundant. No archaeologist questions the identification of Lachish. Click here to see a variety of pictures of these reliefs. None of the cities mentioned in the Book of Mormon have been identified by New World archaeologists. Mormon scholars have theories about where they think the Book of Mormon story may have happened, including Central America, the Ohio Valley, the Baja Peninsula, or the Great Lakes. However, with the exception of Mayan ruins in Central America (requiring one to assume Mayans were Lamanites, strongly denied by Mayan scholars), no evidence for any of the people groups of the Book of Mormon has been found to support any of these theories. This is why there is such disagreement amongst Mormons about where the Book of Mormon lands are located. Many biblical events can be authenticated through archaeology. Events such as battles are often identified in the archaeology of Israel. The Bible tells of Israelite battles with the Egyptians, Canaanites, Philistines, Arameans, Assyrians, Babylonians, Greeks, and Romans. Many of the sites for these battles have been identified. The evidence for the Egyptian conquest, the burning of the city, and the rebuilding of Gezer by King Solomon are all found in the Gezer excavations. In the 10th century BC, the Canaanite occupation of Gezer abruptly ended and an Israelite occupation began. Among the Israelite structures excavated in Gezer is a “Solomonic city gate” that matches the other gates known to have been built by King Solomon. Beneath these Israelite structures is a massive burn layer in which several scarab seals were found that belonged to the Egyptian Pharaoh. The Bible also describes the Assyrian conquest of Israel. In 721 BC the Assyrian conquest of Northern Israel was complete with the utter destruction of every fortified city, including the northern capital of Samaria. In 701 BC the conquest of Judah was nearly completed. Every walled city in Judah was destroyed by the Assyrian armies, except Jerusalem. Archaeologists who excavate the ancient fortified cities in Israel all find evidence for the Assyrian conquest (except in Jerusalem). Then the angel of the Lord went out, and killed in the camp of the Assyrians one hundred and eighty-five thousand; and when people arose early in the morning, there were the corpses—all dead. So Sennacherib king of Assyria departed and went away, returned home, and remained at Nineveh. This miraculous intervention on God’s part is the only plausible reason; without an army, Sennacherib could not attack. Eighty-five instances of armed conflict can be identified in the Book of Mormon. We will only discuss two of the most prominent battles, both of which happened on the same plot of ground, at a Book of Mormon site called the Hill Ramah/Cumorah. In the final battle of the Jaredites at the Hill Ramah (same as Cumorah, see Ether 15:11), it states, “There had been slain two millions of mighty men, and also their wives and their children” (Ether 15:2). Imagine the archaeological evidence that would be left behind after a battle of this magnitude. In the final battle between the Nephites and the Lamanites, also at the Hill Cumorah, about 230,000 Nephites were slain (see Mormon chapter 6). Again, imagine the evidence this battle would have deposited on or near the Hill Cumorah. The location of the Hill Cumorah is understood by most Mormons to be in New York state. In accordance with early Mormon prophets and the Book of Mormon, this hill is the same place where Joseph Smith found the gold plates from which it is said he translated the Book of Mormon. If these monumental battles took place at Cumorah, as the Book of Mormon states, there should be copious evidence for Mormon archaeologists to find. To date, however, no evidence for these massive battles has been discovered. As a result, Mormon archaeologists insist there must be another Cumorah situated in a mysterious location. Possibly the greatest proof for the trustworthiness of the Bible are the manuscript evidences. The Dead Sea Scrolls were discovered in Qumran between 1947 and 1956 at the northwestern coast of the Dead Sea. More than 900 different scrolls were discovered in caves near the ruins of a Jewish community known as the Essenes sect. Contained in the Dead Sea Scrolls are all of the books of the Hebrew Old Testament, with the exception of Esther. In all, about 220 Old Testament manuscripts were discovered. These biblical texts were copied between the years of 150 BC and 68 AD. These manuscripts authenticate the Old Testament. Click here for a video with Joel Kramer. For more information about the Dead Sea Scrolls, click here. About 5,800 ancient hand-copied Greek New Testament manuscripts have been identified. Some of these texts date to the second century, with increasing numbers in the third century and following. This huge volume of manuscripts authenticates the trustworthiness of the New Testament. For a series of article on this topic, click here. There are no manuscripts for the Book of Mormon in existence today that pre-date Joseph Smith. The earliest manuscripts of the Book of Mormon were written in English in the early 1800’s. Mormonism claims Joseph Smith found ancient gold plates that contained the Book of Mormon story. According to Mormonism, these plates were taken by God after the translation was completed. I want to emphasize this point because this is important –There are NO ancient manuscripts of the Book of Mormon. There is plenty of evidence supporting biblical persons, places, and events as recorded in thousands of ancient manuscripts. These evidences show that the Bible is trustworthy as authentic history. However, no evidence has ever been found in the New World archaeology that proves any person, place, or event discussed in the Book of Mormon; in addition, there are no ancient manuscripts for the Book of Mormon that pre-date Joseph Smith. The lack of evidence makes it reasonable to conclude that Joseph Smith invented the Book of Mormon. 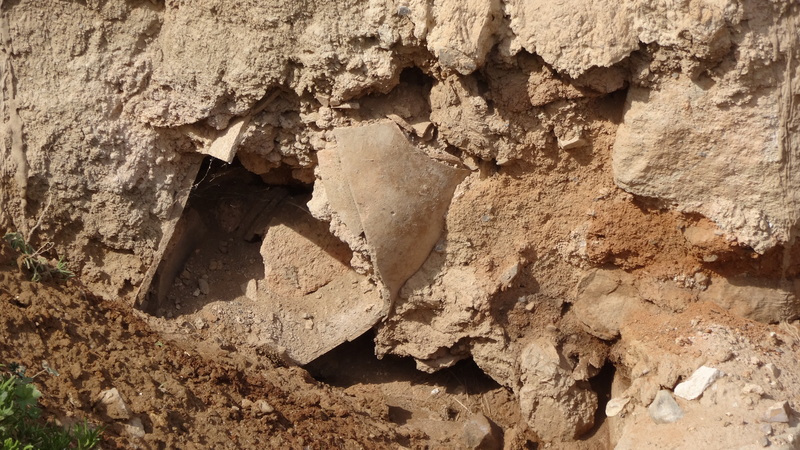 There are some practical ways it is possible for a Christian layperson to possess artifacts and use biblical archaeology in witnessing to LDS friends and family. The Romans used Latin on some of their coins; since the Latin alphabet is the basis for the English alphabet, Roman coins are available today that have the names of biblical persons that can be read. These coins are a great evangelism tactic and are accessible to anyone who is interested. For the biblical authorities listed below, I recommend looking for a large bronze Roman coin called a “sestertius.” If you shop wisely, you should be able to purchase these coins for somewhere between $30 to $50 each. You can find these coins for sale on eBay by selecting the search title “Coins & Paper Money,” then type in the name of the biblical person. Augustus – Look for a coin where you can read ‘AVGVSTUS’ on the side of the coin with the image of Caesar Augustus. Agrippa – Look for a coin where you can read ‘AGRIPPA’ on the side of the coin with the image of the Roman General Marcus Agrippa. The two Agrippas mentioned in the Bible were named in honor of this Roman war hero. Claudius – Look for a coin where you can read ‘CLAVDIVS’ on the side of the coin with the image of Claudius Caesar. Ancient coins with the names of biblical cities on them can be found in bronze and silver. Antioch – Look for a bronze Roman coin that says “ANTIOCH” on the reverse side of the coin. Philippi – Look for a silver Roman denarius with the letters PHIL on the reverse side of the coin. Ephesus – This is a rare and expensive silver coin that not only mentions Ephesus but also the pagan goddess of Ephesus, Diana. Look for a coin that says DIANA EPHESIA on the reverse side. You can view this coin by searching “Diana Ephesia” in Google images. It is possible to purchase ancient biblical pottery on eBay. Search in Antiquities for pottery featuring Canaanite, Israelite, Judean, Hasmonean, or Herodian. If you are fortunate, you might find some pieces of pottery that are provenanced (the seller knows the biblical city where they were found). It is also possible to purchase ancient (300- to 600-year-old) Hebrew Torah scroll fragments on eBay. Just search “torah scroll” and you can purchase these beautiful ancient manuscript fragments for as low as $50 to $100. In our Christian coffee house in Ephraim, Utah, we have created a Bible museum where pottery and pottery fragments are displayed from dozens of different biblical sites. This display has become one of our primary witnessing tools. It allows us to talk with interested Mormons (almost daily) about the trustworthiness of the Bible. You can actually own and use real biblical archaeology in your witness with Mormons. Real Bible artifacts will fascinate Mormons and open doors for you to engage them with the truths of God’s Word. Our faith is built upon solid evidence and we can use this information to help Mormons find the truth and enter into a relationship with the true God of the Bible. Archaeology cannot prove or disprove a historical book. However, the science of this field can provide the evidence necessary for a person to determine if having faith in a particular scripture (i.e. in this case, the Bible, the Book of Mormon) is reasonable. When everything is considered, there is good reason to believe the Bible accurately portrays history. Through the purchase of nominal investments (i.e. biblcial scrolls, coins, pottery, etc), the Christian can provide a way for the Mormon to not only see but also touch real items of history. Nothing like this can be obtained to support the Book of Mormon since the places where this scripture’s events took place are debated. Using this approach to get a Mormon to rethink his or her presuppositions is a successful approach that can be used by anyone to share the Gospel with Mormons! Daniel (Chip) and Jamie Thompson moved their family from Phoenix, Arizona to Ephraim, Utah in 1991 to start the Ephraim Church of the Bible. They later founded Tri-Grace Ministries and began a Christian club at Snow College. The Solid Rock Café, located across the street from the college, serves as a safe haven for college students to have open spiritual discussions. Among other activities, the Thompsons host college mission groups, organize an evangelistic outreach at the LDS Mormon Miracle Pageant each June and lead the Tri-Grace Israel tours. Chip authored Witness to Mormons in Love: The Mormon Scrapbook Revised Edition in 2014. For more information, visit www.TriGrace.org. Was Jesus born “at Jerusalem”? Beit Lei: Another “proof” for the Book of Mormon? NHM – A Place Name from the Book of Mormon? Are ancient coins mentioned in the Book of Mormon? Nephite Synagogues–Where did they originate?